Enjoy your favorite TV shows everywhere. Cook along with your favourite food program in the kitchen. Handy way to mount a small flat screen TV in a cabinet or around a corner in your kitchen, workspace and children's room. 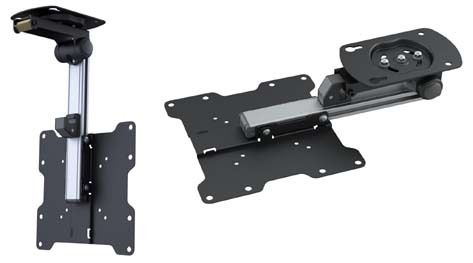 This ceiling mount can be easily folded (push-in fold/push-in unfold) and ideal for cathedral ceiling installation and space saving. Its swivel, sliding can offer the best viewing angle. It support most 17-37 monitors up to 20kgs/44lbs.